By Chris Williams on November 6, 2014. If a child or pet gets stuck in a mouse glue trap, many kinds of oil will help remove it. There is an easy way to remove the glue. The antidote is a product that fortunately is available in every home – cooking oil. Many consumers already know that you can use cooking oil to dissolve chewing gum or the glue on those pesky store price stickers. It’s the same principle here…oil dissolves glue. Slowly and carefully pull the trap away from the skin’s surface. Most of the glue should remain in the trap. Dab the glue that remains on skin or hair with vegetable oil (corn oil, canola oil, olive oil), mineral oil, baby oil, or smooth peanut butter. Let the oil sit for several minutes. Using a dry cloth, rub the area to remove the softened glue. Repeat the process if necessary, and then wash the skin or hair with soap and water to remove the oil. Whenever a non-target animal, pet or otherwise, is trapped on a glue trap, it’s best to have a veterinarian attempt the removal in order to avoid injuring the animal in the process. Wear heavy gloves to avoid bites. Pour cooking oil on the trap glue at the points where the animal is caught and massage the animal’s skin or fur to work the oil into the glue. You may need to use a lot of oil (but don’t drown the poor animal!) so do this where spilled oil won’t be a problem. It will take a few minutes for the oil massage to work. Once the animal is free, give it a soapy bath to remove the oil (if it’s your pet) or take it to a veterinarian for follow-up care. 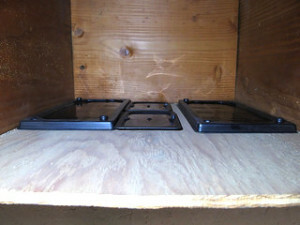 To prevent the above scenarios in the first place, place your mouse glue traps inside a trap station or bait station so that children and pets can’t reach them. Want to learn more about mice & rats? Download our free e-book Identifying and Removing Mice & Rats From Your Home!